Prime Minister Justin Trudeau says he will seek a formal apology from Pope Francis for the Roman Catholic Church’s role in residential schools, a day after the Truth and Reconciliation Commission made public its final report into the legacy of the schools. Trudeau’s comments came during a news conference in Ottawa after he met with the leaders of five national aboriginal organizations to discuss the commission’s final report. Trudeau — who has committed to implementing all 94 of the commission’s calls to action — said he couldn’t guarantee the Pope would issue an apology, but was prepared to raise it directly with him, given the opportunity. “I look forward to having a conversation with His Holiness about this,” Trudeau said on Parliament Hill. Former prime minister Stephen Harper met with Pope Francis at the Vatican in June and drew his attention to the Truth and Reconciliation Commission’s 94 calls to action, which include the request for an apology. Harper was criticized by the opposition parties and other critics for not being more direct. In an interview on CBC News Network’s Power & Politics, interim Conservative Party Leader Rona Ambrose said while a formal apology from the pontiff is out of Trudeau’s control, she didn’t see anything wrong with him seeking one. Ambrose was asked about a statement issued the day before by her party’s indigenous critic Cathy McLeod to mark the end of the TRC’s mandate, which began in 2008, two years after Stephen Harper’s Conservatives first came to power. Ambrose said it was “positive” of the government to welcome the report but expressed concern with Trudeau raising expectations “too high” by accepting all 94 calls to action. 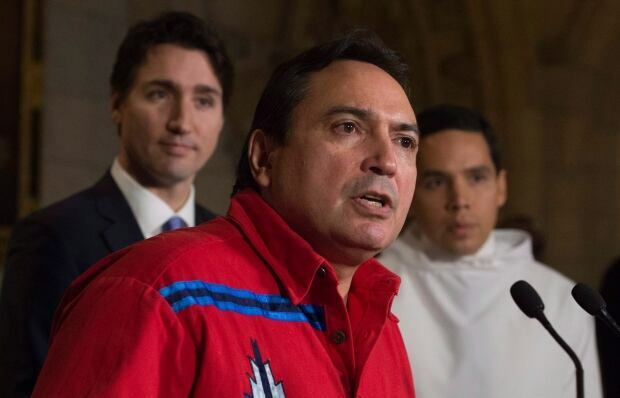 Perry Bellegarde, the national chief for the Assembly of First Nations, said an apology from the pontiff would help redress the legacy of residential schools and advance reconciliation between indigenous people and the Roman Catholic Church. “Roman Catholics in Canada and across the globe look to the Pope as their spiritual and moral leader,” the commission said in its final report made public on Tuesday. The statement came following a private audience with the leaders from the Roman Catholic community in Canada and a delegation of aboriginal leaders, which included former national chief for the AFN Phil Fontaine. Trudeau met for approximately two hours this morning with Bellegarde and Congress of Aboriginal Peoples Chief Dwight Dorey, Native Women’s Association president Dawn Lavell-Harvard, Métis National Council president Clément Chartier, and Inuit Tapiriit Kanatami president Natan Obed. “We talked about a number of specific issues, but also engaged directly on how we’re going to work together collaboratively to address these problems … and opportunities concretely,” the prime minister said. Trudeau reiterated his commitment to addressing the “fundamental inequality” between indigenous and non-indigenous Canadians. “I think it’s natural for people to feel guilty about mistakes of previous generations, but I don’t think we should be wallowing in it or thinking that just feeling guilty is enough. Let’s put that energy and that desire towards fixing things,” Trudeau said. 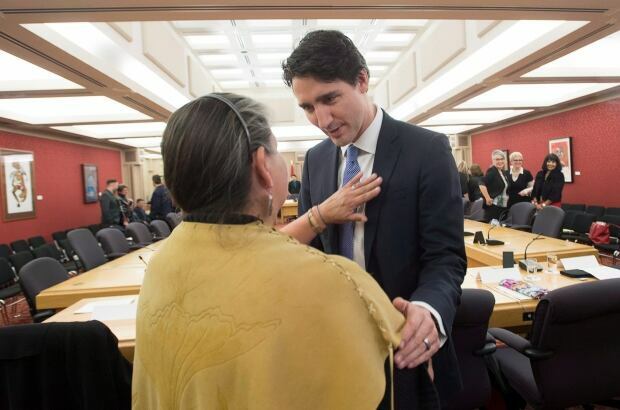 Indigenous and Northern Affairs Minister Carolyn Bennett, Justice Minister Jody Wilson-Raybould and Status of Women Minister Patricia Hajdu — Trudeau’s lead ministers for the government’s inquiry into murdered and missing indigenous women — were also part of the talks. Reporters also saw Health Minister Jane Philpott, Heritage Minister Mélanie Joly and Employment Minister MaryAnn Mihychuk entering the meeting Wednesday morning. The commission also found that the harm done to Métis children who attended residential schools “was substantial,” but Métis as a people were excluded from the Indian Residential Schools Settlement Agreement. Clément Chartier, a survivor of a Métis residential school, said he raised the report’s findings during the meeting with Trudeau Wednesday morning. “We were given assurances that… our issues will be looked at. I believe that’s very critical to us,” said the president of the Métis National Council. Chartier, whose mother was killed when he was a teenager in residential school, said he welcomed the government taking steps towards the launch of an inquiry into missing and murdered indigenous women. Trudeau has vowed to work with the leaders of the aboriginal organizations, the provinces and territories, parties to the Indian Residential Schools Settlement Agreement and other key partners in responding to the commission’s 94 calls to action. “I’m announcing that we will work … to design a national engagement strategy for developing and implementing a national reconciliation framework, including a formal response to the Truth and Reconciliation Commission’s calls to action,” the prime minister said on Tuesday. Tears are fine, but will Trudeau respect Indigenous rights to resources?